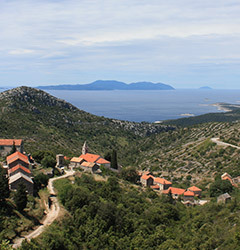 The medieval town of Labin is situated on the hill above Rabac. Its old name of Albona was first mentioned in 285 AD. The birthplace of Matthias Flacius Illyricus, the reformer and collaborator of Martin Luther, it is a cultural and administrative center today. The rich cultural and architectural heritage of Labin is enlivened by number of art ateliers and by the bustling youth gathering in the coffee bars scattered around the old town. The Sculpture Park in nearby Dubrova features over 70 forma viva stone sculptures. After a walk through the narrow streets of the Old Town, pay a visit to the Town Museum with its archaeological and unique in this part of Europe, a miniature coal mine. Have a look at the Memorial collection of Matthias Flacius Illyricus, peek into the art ateliers, enjoy the view of Rabac and Cres island from the Fortica or pop into the small, elegant shops and take refreshments on one of the terraces of the local coffee bars. 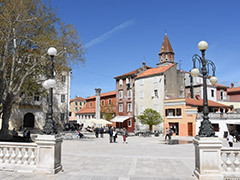 Whether to do business or just to have a chat, these are the places where everyone meets.Labin, a picturesque town situated on a 320 meters high hill and only three kilometers from the seaside, was inhabited already two thousand years B.G. The remnants of Kunci, one of the settlements called the 'castellums', dating from the Bronze Age, can be found in the vicinity of Labin. 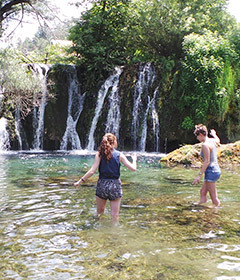 Its old Illyrian-Celtic name is Albona or Alvona and it was probably founded by Celts in the 4th century B.C. on the ruins of the ancient city. Some historians say it was fortified by the Illyrians in the 11th century B.C. They also say that Albona in the Celtic language means 'a town on the hill' or 'an elevated settlement'. Titus Livius said that Labin inhabitants were pirates. After the conflicts between the local inhabitants and Romans, which had started in the 3rd century B.C., Istra came under the Romans in 177 B.C. The borderline was the river Rasa. Labin and its surroundings thus became an integral part of Illyrian, the Roman province with a high degree of independence and authority over the nearby settlements. The oldest written document about Labin is a relief from the 3rd century with the insertion 'RES PUBLICA ALBONESSIUM'.